The boys deemed it unfixable, which is saying something, and showed me the somewhat alarming Jamesification that heated the water (open gas flame inside a wooden structure, anyone?). I talked to Mark about it before he left for his year on the East Coast, but there were a lot more pressing problems to deal with. 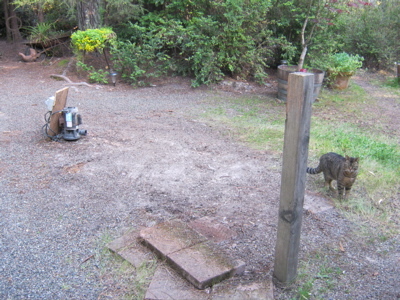 But one day I came home and found that the hot tub had (mostly) been removed. Surprisingly, they are able to jump to the ground or into one of the chairs from the (slippery) glass rooflet on the back porch. In other hot tub news, my brother went all the way to Willits to acquire a second hand and reasonably-priced Japanese wood-fired hot tub called a Chofu. Like tofu, only not gross. Since space is at a premium in Japan, the unit which holds the logs is very small, but well insulated and efficient. 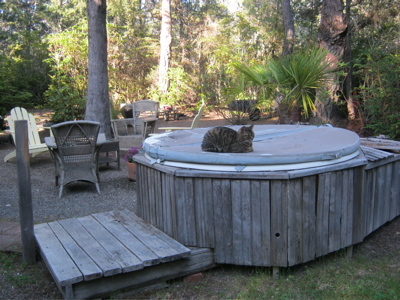 The tub is big enough to hold four people and overlooks the palatial garden. 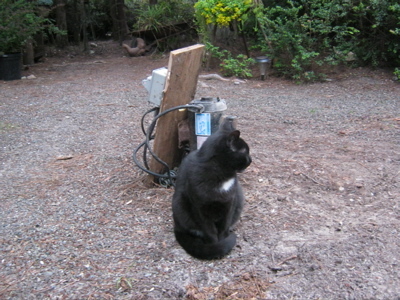 As you can imagine, it’s a favored place to hang out and relax after hours of working on said garden. I’m sure you will get use not having the hot tube but not so sure about the cats, yes, animals are truly amazing, those without ever having these kind of friends are truly missing out.